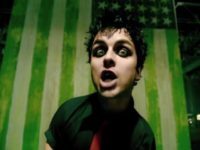 British anti-Trump activists launched a campaign to push Green Day’s hit 2004 rock song “American Idiot” to the top of the charts, despite the fact that the song was inspired by former president George W. Bush and the Iraq War. 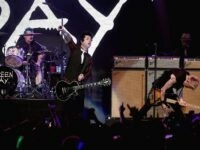 On Sunday night, the punk rock legends of Green Day joined local the East Bay’s SWMRS to put on a concert to raise money in honor of the victims of a deadly Dec. 2 fire at the Oakland warehouse known as the “Ghost Ship,”where 36 people died. 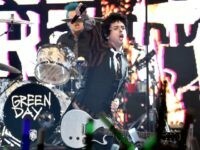 Green Day lead singer Billie Joe Armstrong put a spin on the band’s 2004 song “American Idiot,” using the altered lyrics to attack Donald Trump during a performance Sunday night at the 2016 MTV Europe Music Awards. 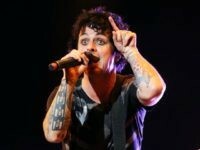 Billie Joe Armstrong, frontman for rock band Green Day, became the latest celebrity to compare Republican presidential nominee Donald Trump to Hitler in an interview this week. 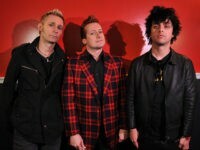 Rock band Green Day has returned after a four-year hiatus — and their new single “Bang Bang” is all about mass shootings and the “narcissistic social media” coverage that the tragic events often engender.